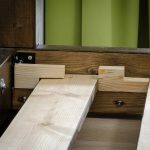 This article is about the design and build of my IKEA Hack woodworking project: DIY storage bed frame with bookshelves on the sides, a 6-drawer dresser in the end and plenty of usable space underneath. 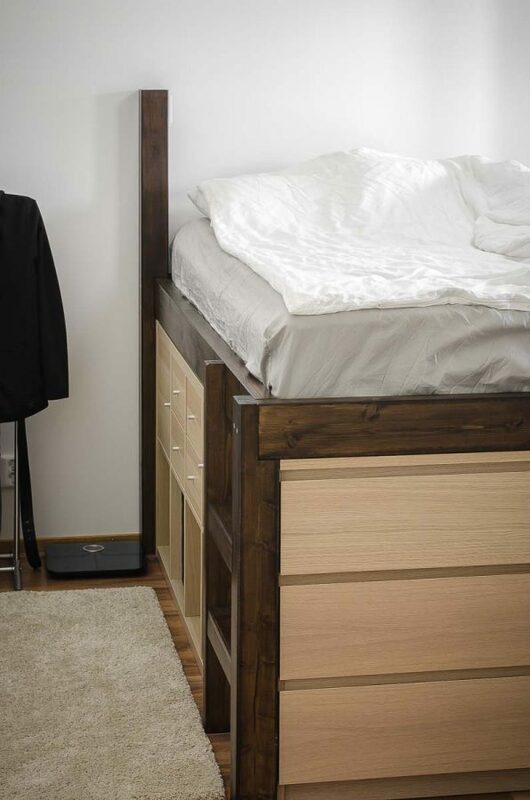 Main storage of the bed consists of two KALLAX-bookcases on the sides. In addition, there is a MALM-dresser for clothes and a large open area in the middle for boxes. Top of the mattress is 110 cm from the floor. 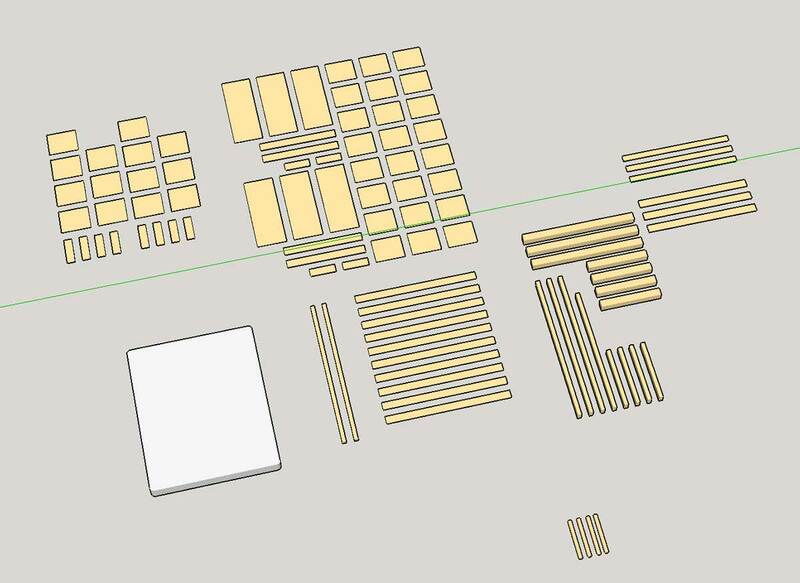 The first plan was to make the storage units underneath myself from Glued laminated timber but after making the technical drawings I came up with 85 parts. 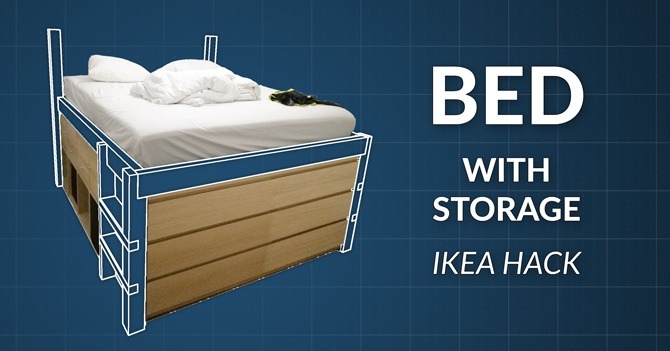 In conclusion, I decided to use whole storage units from IKEA. 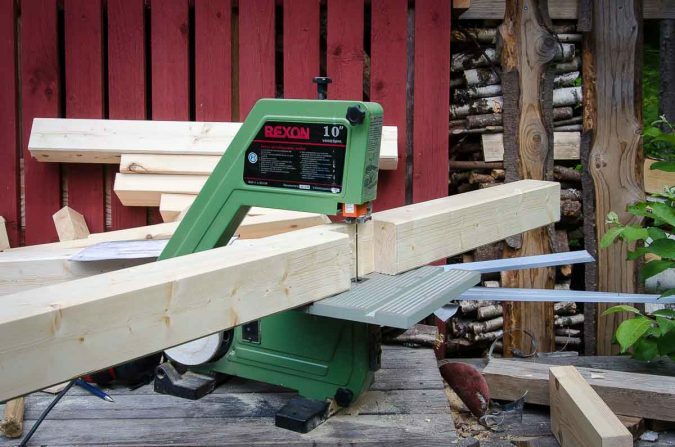 This would save me quite a bit on labor and materials. 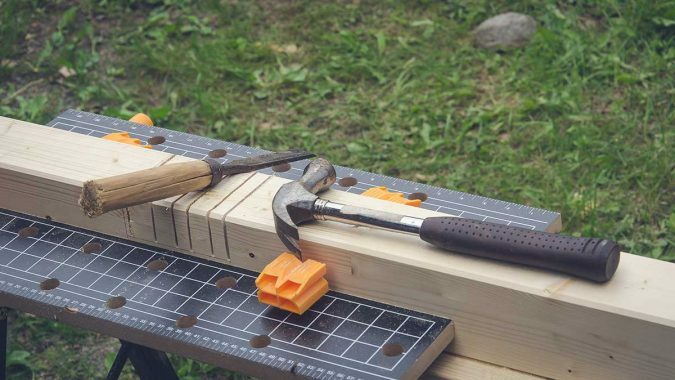 Using IKEA stuff like this makes kind of an IKEA Hack I guess, even when I did not chop anything up. 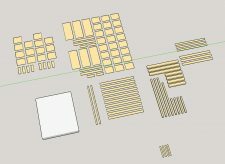 I measured and 3D-modeled all the furniture. 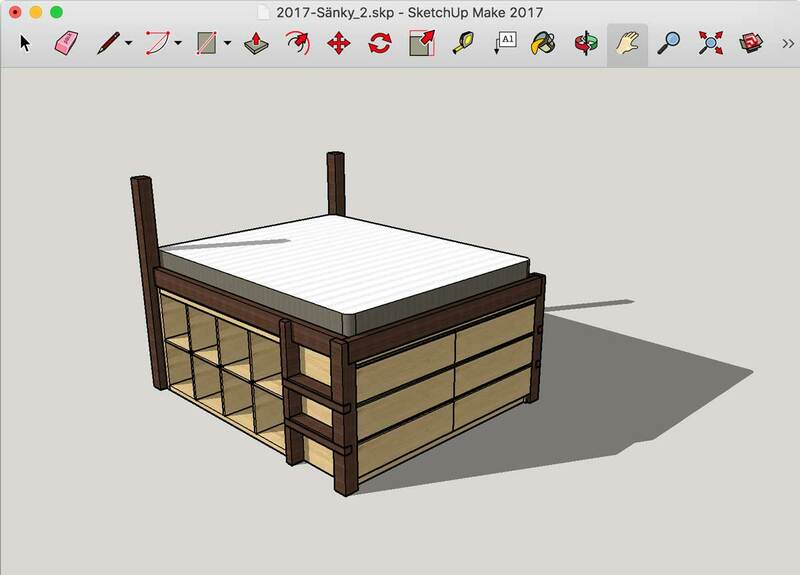 The wooden storage bed frame was then designed around those models in Sketch Up. Plans were printed out and materials purchased from a local hardware store. Everything was packed in a trailer and off to the summerhouse we go to manipulate some tree carcasses to sleep on! You can download the dimension drawing in the bottom of this article. Unfortunately, I do not yet own bigger woodworking tools like bandsaw or drill-press. Luckily I had the option to build the parts on my friend’s summerhouse over the weekend. I had lots of beer and proper drawings so the process of making the parts was rather easy! The only real problem was because the ground I test-assembled the frame was uneven. Also, the occasional rain was a problem since I was working outdoors. You can find the bed frame design at the bottom of this article. I test assembled the bed frame to figure out that all the holes and joints were aligned properly. After the test assembly, I numbered the parts and took apart the frame and packaged everything in the car. Back at home, I sanded the parts with 80 grit and 240 grit sandpaper. Parts were cleaned and given two coats of hazel color stain varnish with a brush. 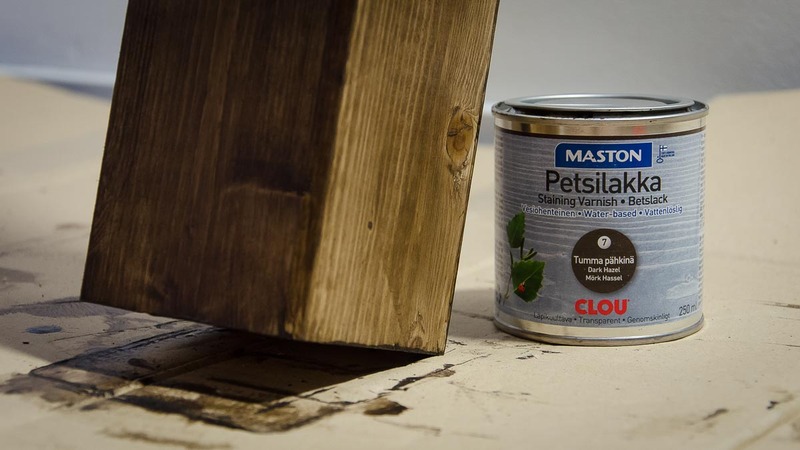 This made the raw pine to look a bit more classy and to seal the surface to make it easier to clean. Note: Do not paint the wooden parts that are against the mattress or the varnish will slowly rub off into it. When parts had properly dried, it was time to assemble the frame for the first time properly. The first part I assembled was the main supporting frame. I laid all the frame parts on the floor in the final arrangement. I aligned the parts by using the walls of the room as a square and mounted them together using angle-brackets and a bunch of screws. 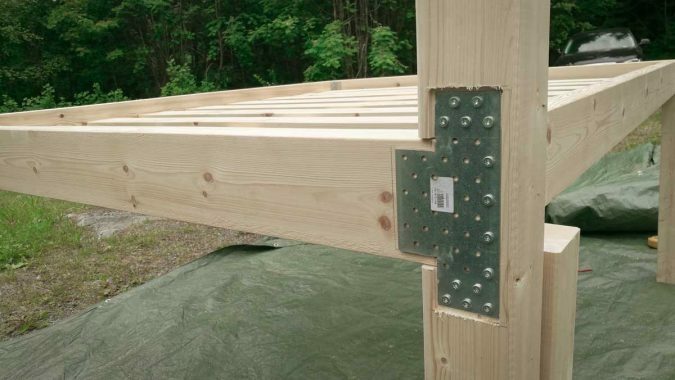 After making the square I mounted the long middle support beam with larger angle-brackets. The design of the bed frame is such, that no screw should carry the weight of the sleeper. 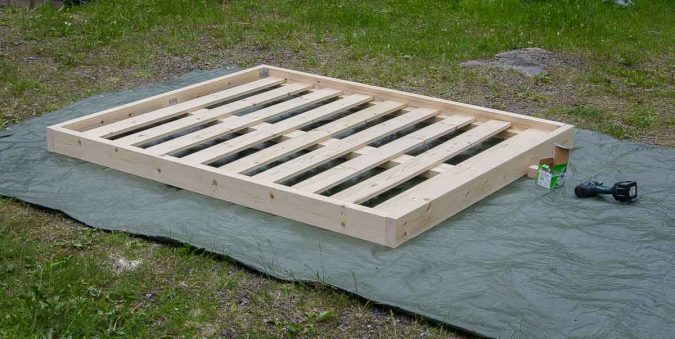 The self-supporting structure also makes the bed frame quite easy to assemble. After I had assembled the rectangular bed frame, it was time to mount the legs. First I mounted the longer legs with the screw-in flat brackets to the frame. I supported the rest of the structure by cardboard moving boxes. With the long legs in place, I screwed in the short legs and the one in the middle. I used three strong screws and anchors to mount the frame to a concrete wall through the horizontal beam making the bed immovable and really sturdy. This is how you silence the bed: ropes and wall mounting. To make the even spacing between the slats that support the mattress I had made a small wooden jig. I used thin rope between the slats and the support beams. 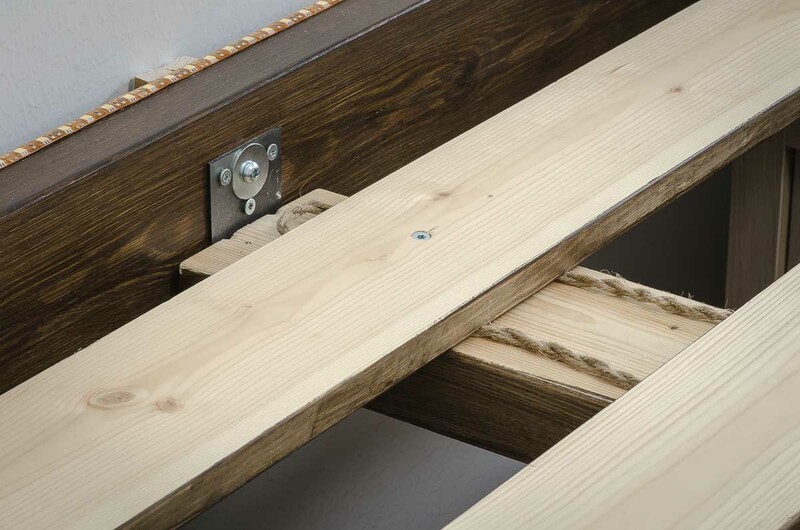 This keeps the slats and the varnish from sticking and rubbing against the support frame, therefore making the bed frame completely silent while the sleeper tosses and turns during the night. 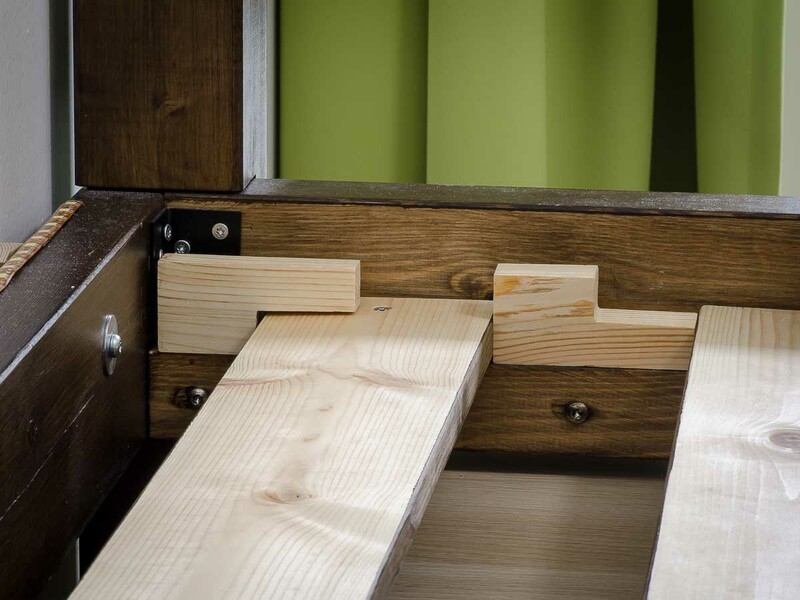 Screwing the bottom slats to the frame completes the support structure. After I built and mounted the ladder to the frame, next I assembled all the storage units. 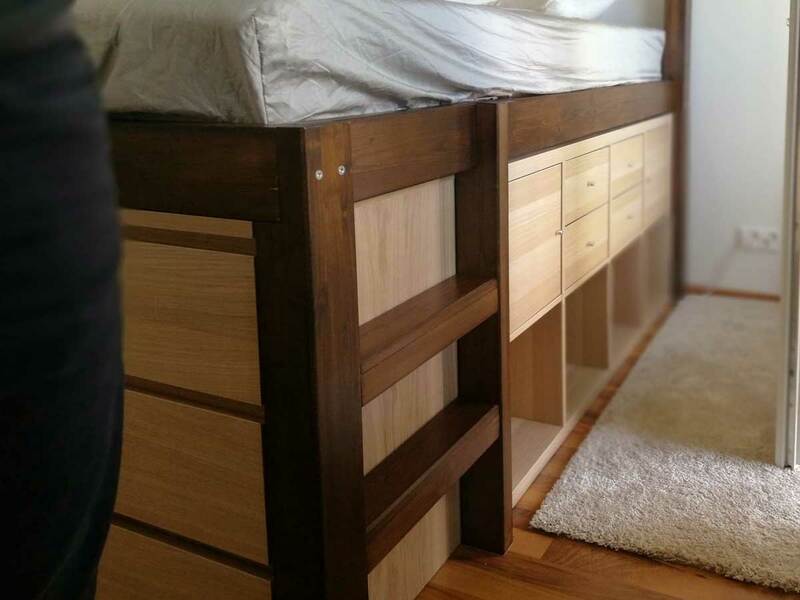 After hours of hard labor, it is just a delight to see the storage units to just slide neatly in place under the bed frame. Hard parts are over. I put the mattress in its own little dent on top turning the frame into an actual bed. Then I followed with mattress topper, bed-sheets, blankets and pillows in the bed. 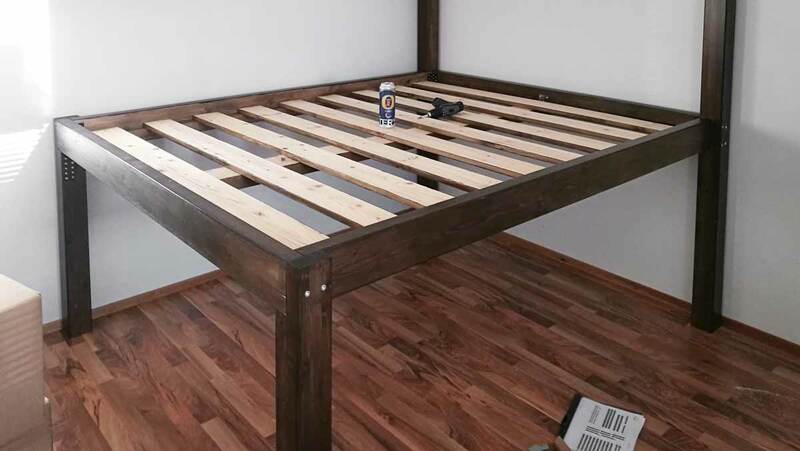 I’m quite happy how the bed turned out, it’s exactly what I expected! 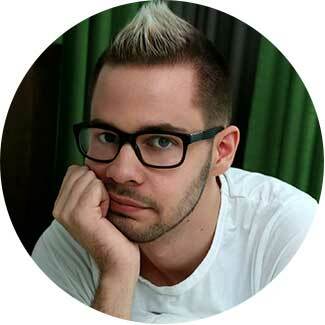 The frame is really sturdy with a clean and rather minimalistic design. I received a lot of complaints about the bed is difficult to access so I added the ladder as an after-thought. Did you find this helpful? Leave a comment below!